Hotel complex "Twins palace" opened in the summer of 2011. 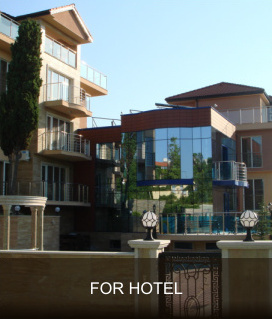 The complex will be accepting visitors all year round in the heart of the oldest Bulgarian resort, "St. St. Konstantin and Elena", also known as the 'Friendship'. 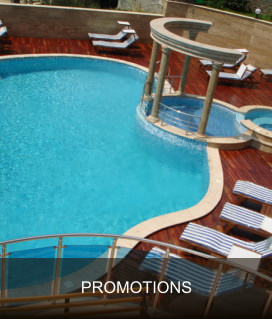 The hotel consists of luxury apartments, all with magnificent sea view. The complex includes an external pool, children pool and Jacuzzi, which in summer are available to our guests. Spa offers a sauna, massage, Jacuzzi, massage bathtub / jet /, celutron, aromatherapy and massages for rehabilitation equipment Nuga best. The lobby bar is working around the clock and will offer our guests a variety of drinks and cocktails. Fish restaurant at the hotel during the summer season will surprise our guests with traditional Bulgarian and Mediterranean specialties. For the convenience of our clients we have selected highly qualified staff that will make your stay with us unforgettable. WE ARE INTERESTED IN OUR CUSTOMERS. 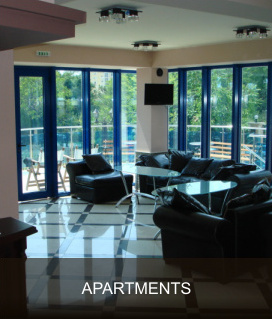 The motto of the Twins palace hotel is comfort, security and tranquility.